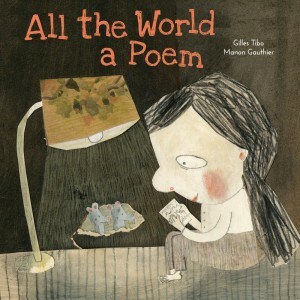 I am totally in love with All the World a Poem, a celebration of the poetry in the world and the world that’s in poetry, written by Gilles Tibo and illustrated by Manon Gauthier, both award-winners in Quebec and internationally. And now their book has been beautifully translated into English by Erin Woods, whose task fascinates me in what it means to translate a poem, poems being is so intrinsically about their language…. Each spread is a different poem celebrating poetry as diverse as the poets who write it, and sometime the poetry is literal (concrete?) and sometimes the poetry is simple (not simple) wonder at the world around one, ephemeral moments and fleeting flyaway things…. …The poems themselves all sophisticated and yet accessible, like the illustrations with their childlike renderings and the richness of texture. Inspiring young readers to see the poetry at work in life and the world, to read it, and maybe even to sit down and write it.